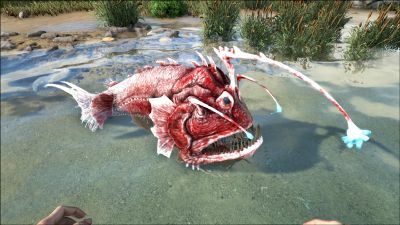 The Anglerfish or Angler is one of the Creatures in ARK: Survival Evolved. Whether its size is caused by adaptation to the Island's other inhabitants, or by cross-breeding with another larger species, Melanocetus angerlpescum is the largest form of Anglerfish I've ever heard of. Typically found among the deepest, darkest expanses of the ocean, this creature preys on smaller fish while being an excellent source of food for larger predators. Melanocetus has an array of bioluminescent light pods at the end of stalks on its head. Like typical Anglerfish, it primarily uses these to attract smaller creatures and trick them into coming close enough for Melanocetus to consume the prey. This often makes wild Melanocetus itself relatively easy to spot among the briny depths. Exploring the depths of the ocean can be difficult. The cold, the lack of air, and the shocking absence of light combine to make travel very dangerous. A tamed Anglerfish can use the natural light at the end of its stalks to illuminate the depths, making exploration not only safer but more lucrative, as I've heard some survivors use this creature to harvest the silica pearls found throughout the ocean's depths! Despite being described in its Dossier as being generally skittish, the Angler will attack the player and any tamed creatures on sight. When damaged in a fight, they will attempt to flee but will turn around and attack again after a short chase. This fish has three bio luminescent lures on its head and an oversized mouth lined with needle-like teeth, perfect for survival in the lowest depths of the Island's ocean. This section displays the Anglerfish's natural colors and regions. For demonstration, the regions below are colored red over an albino Anglerfish. The colored squares shown underneath each region's description are the colors that the Anglerfish will randomly spawn with to provide an overall range of its natural color scheme. Hover your cursor over a color to display its name and ID. For example, "cheat SetTargetDinoColor 0 6" would color the Anglerfish's "body" magenta. Using the (PC), (PS4), (Xbox One), the Angler bites the target. Since the Angler lives deep underwater, the only way to knock it out is with a Crossbow and Tranquilizer Arrows, a Harpoon Launcher with Tranq Spear Bolts (or a Wooden Club, if you're feeling adventurous). Be careful to not deal too much damage at once, as it has relatively low health compared to its torpor, so it's easy to kill it accidentally. The Angler can also deal a decent amount of damage itself, so be sure to suit up in a full set of SCUBA gear. Once they take a bit of damage, they will attempt to swim away. Be careful if you chase them, as they will often turn around and attack again without warning. A good strategy is to bring a tough underwater mount, such as a Plesiosaur, and set it to passive. That way, once it has been shot, the Angler will target your mount instead of you, giving time to take it down in relative safety. This section describes how to fight against the Angler. One must first take into consideration the environment that the Angler lives in, the deep ocean. Other animals patrol these waters, making Angler combat or taming difficult. Ichthyosaurs, though friendly, tend to swarm the player and can easily become overwhelming if one attracts the attention of too many of them. Additionally, predators like Megalodon, Mosasaurs, and Plesiosaurs can attack at any time: even the Anglers themselves are dangerous. Finally, asphyxiation and temperature hazards will finish off any survivors rather quickly that have not equipped themselves with a full set of SCUBA Gear. Often, the angler will be the one attacking you. In that case, use your mount if it has enough health and attack damage, but also make sure your mount has a quick turning circle to compete with the angler's agility. Fighting the Angler without a mount is also possible; use ranged melee weapons that can keep Anglers at bay, like Pikes (Spears are not recommended due to break chance) and when it runs away, use a Crossbow or a Harpoon Launcher to finish it off. Use a Crossbow or Harpoon Launcher for ranged, and a Pike or Sword for melee. A powerful mount can also deal with anglers. When chasing it, be aware that it can turn around and attack again. Also make sure to keep an eye out for other, dangerous animals. When compared to other marine predators, the Angler has a low threat level. The Angler does not require a saddle to ride, making it a decent mount for seafaring survivors that are short on resources. Deep Sea Exploring Mount : Thanks to their light, the angler is perfect for exploring the depths of the sea. Raise Melee Damage and Health to be able to fight the powerful creatures that spawn in the depths, or raise Movement Speed and Stamina if you plan to escape from them and avoid them. Angler Gel Hunter : The light on the angler attracts other angler fish, making it a good way to collect angler gel (Level up Melee Damage and Health). 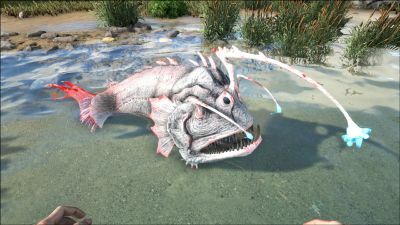 Silica Pearls Farmer : Since Patch v257, Anglers can now harvest silica pearls with their bite attack. Since Patch v257, Anglers now harvest silica pearls with their bite attack. This was originally planned to be a Liopleurodon feature according to the dossier but got moved to the Angler. Color region 4 is listed as not used, when it in fact colors the dots along their sides. Anglerfish aren't able to harvest Silica Pearls in ARK: Survival Evolved Mobile since Silica Pearls spawn on the beach. This is due to the fact that Mobile wasn't originally set to include Aquatic Creatures. The specific epithet anglerpescum is a pseudo-Latinization of the English word "anglerfish", retaining the first half as it is and replacing the second half with a corrupted form of Latin piscis (meaning "fish"). In real life, only female angler fish have a light. The males do not. Males rely on females for light. This page was last edited on 14 April 2019, at 16:19.